I am very confused about the pronunciation of the Hare Krsna maha-mantra. If you could properly instruct me on the correct pronunciation, I would very much appreciate that. Also, I am curious about the importance of correct pronunciation. Also, to taste the mature fruit of love of God that is available by chanting Hare Krsna, it is necessary that one receive initiation from a spiritual master in the disciplic succession that comes from the Lord Himself. In the Padma Purana it is said that unless one receives initiation from such a bona fide spiritual master, one will not be able to obtain the desired result from chanting the mantra. To get the full benefit of chanting Hare Krsna, one should hear the chanting from the lips of a pure devotee of the Lord. The insincere chanting of nondevotees should be avoided; it is compared to milk touched by the lips of a serpent, because it has a poisonous effect on one’s spiritual life. 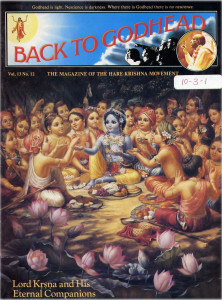 Authorities confirm that the chanting of the Hare Krsna maha-mantra is the most recommended method for spiritual realization in the present age. If one searches through the entire Vedic literature, one will find no method of spiritual advancement superior to the chanting of the maha-mantra—Hare Krsna, Hare Krsna, Krsna Krsna, Hare Hare/ Hare Rama, Hare Rama, Rama Rama, Hare Hare. In an old copy of The World Book Encyclopedia there are approximately 170 different religions listed in the United States. (There are many more today, I would imagine.) I have often wondered why we find such division within Christianity, since the Bible is the basis of the Christian religion. How is one to know which religion is the true religion? “Unless one comes to the Absolute Truth, there is no possibility of agreement. Nasav rsir yasya matam na bhinnam: it is said that a great learned scholar or sage cannot be exalted unless he disagrees. On the material platform, there is no possibility of agreement; therefore there are different kinds of religious systems. However, the Absolute Truth is one, and when one is situated in the Absolute Truth, there is no disagreement. On that absolute platform the Supreme Personality of Godhead is worshipable, as stated in Bhagavad-gita (bhaktya mam abhijanati yavan yas casmi tattvatah). On the absolute platform, the worshipable Deity is one, and the process of worship is also one. That process is bhakti (devotional service).